While shopping recently I tried on this Lauren top and noticed it has enough elastic in the arm to be worn both ways. When I got home I played with several of my other "off-the-should" tops and noticed that they can be worn either way as the top above - Versatility. One other nice top that I purchased last season was the Soft Surrounding "Underwire T". What a great fit. This year they do not have it in stripe but it is still available in solids. I have worn it with my regular bra for that something extra look or as it was intended. Very flattering is how Soft Surrounding describes it. 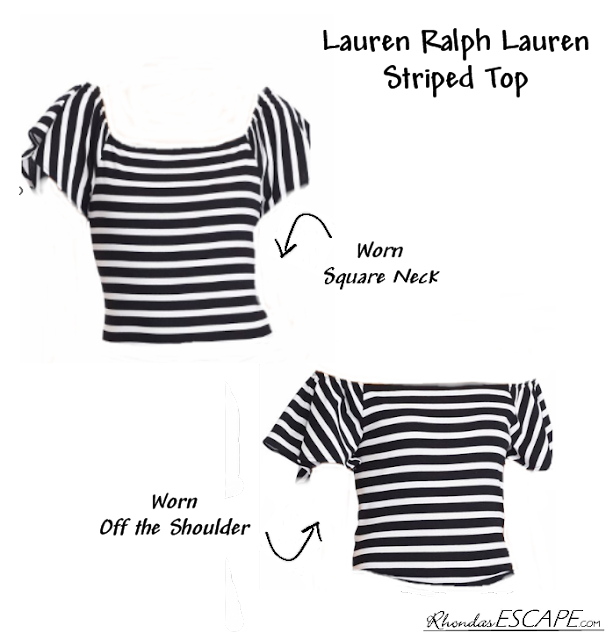 Wearing it off the shoulder is great because there are no bra straps to deal with - Underwire and shaping built it. First let’s talk versatility! Our Underwire Tee comes in three different styles: tank, ¾ sleeve, and tee. This basic tee features our 2 cloud rating of “heavenly soft” and comes in over 12 different hues. Perfect for a woman of any size, we have innovated our underwire tee to gently lift and sculpt while accenting a slim fit. Best of all, this women’s shirt is sized by bra size so no need to fear for the well-endowed! The Underwire Tee is a great option to pair with a stunning bottom. Simple enough to let your other pieces shine, but just daring enough to stand out.